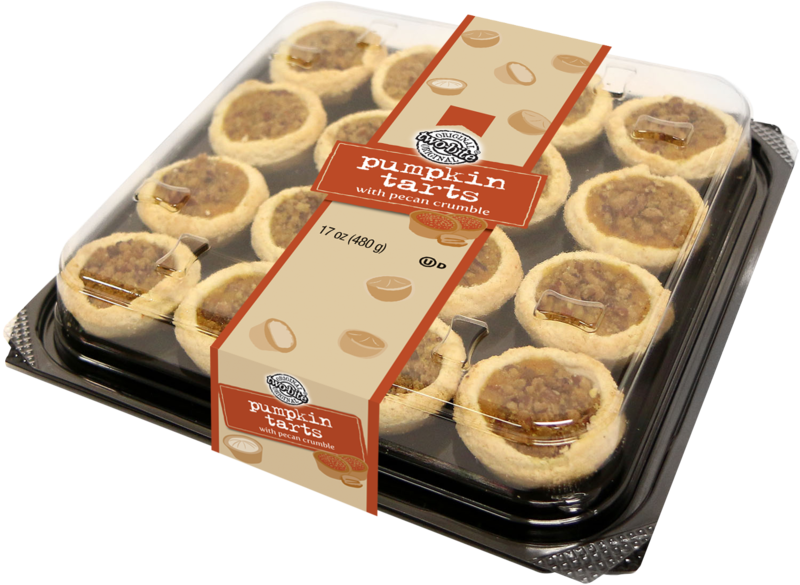 There are some important traditions around tarts, and two-bite® is not about to break them. So there’s golden pastry, carefully prepared. Inside, only the very best ingredients-and, throughout, a generous helping of loving care. All in the most fun size available anywhere. So take your pick of fillings (you’ve got more than a dozen to choose from). And continue the tradition, two-bites at a time. 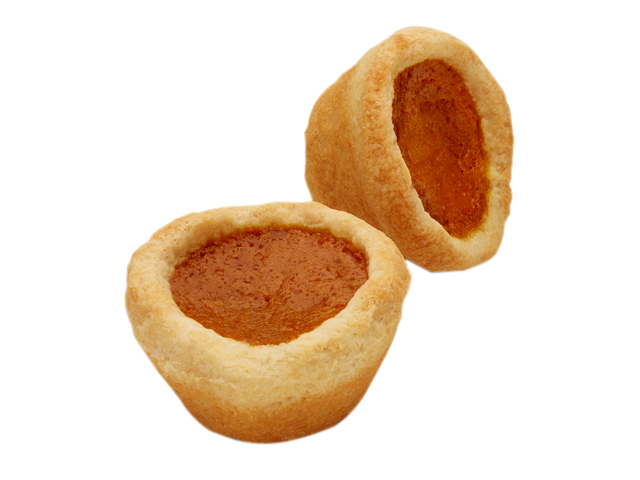 Buttery tart shells with a delicious pumpkin pie filling. INGREDIENTS: ENRICHED WHEAT FLOUR (WHEAT FLOUR, NIACIN, REDUCED IRON, ASCORBIC ACID AS DOUGH CONDITIONER, THIAMINE MONONITRATE, RIBOFLAVIN, FOLIC ACID), SUGAR, SHORTENING (PALM OIL, SOYBEAN OIL, FRACTIONATED PALM OIL), PUMPKIN, EGGS, SWEETENED CONDENSED MILK (CONCENTRATED MILK, SUGAR, LACTOSE), WATER, SOYBEAN OIL, DEXTROSE, CORN SYRUP, MODIFIED CORNSTARCH, MARGARINE (SOYBEAN OIL, FRACTIONATED PALM OIL, WATER, SALT, WHEY [MILK] , SOYBEAN LECITHIN, MONOGLYCERIDES, NATURAL FLAVOR, ANNATTO EXTRACT [COLOR], VITAMIN A PALMITATE, VITAMIN D3), SALT, VINEGAR, SPICES, COLOR (BETA CAROTENE), POTASSIUM SORBATE (PRESERVATIVE), SOYBEAN LECITHIN, XANTHAN GUM, LOCUST BEAN GUM, GUAR GUM. 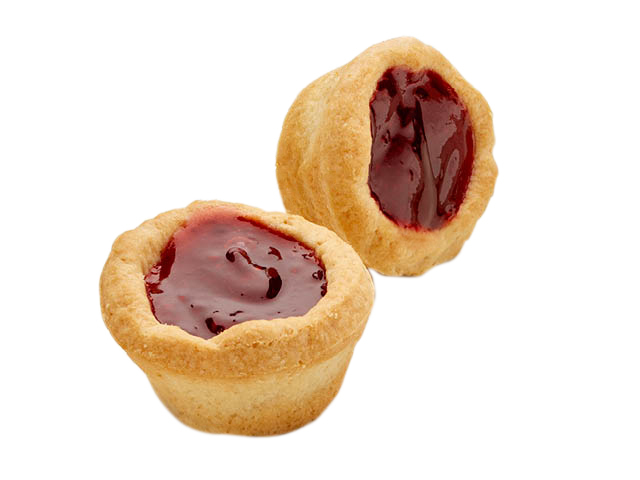 Buttery tart shells filled with a sweet raspberry filling. 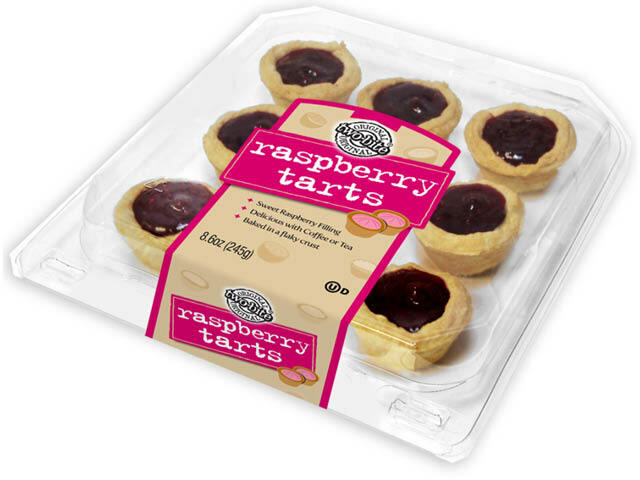 INGREDIENTS: RASPBERRY FILLING [SUGAR, WATER, RASPBERRIES, GLUCOSE, MODIFIED CORN STARCH, PECTIN, CITRIC ACID, NATURAL AND ARTIFICIAL FLAVOR, SODIUM BENZOATE (PRESERVATIVE), COLOR (FD&C RED #40, FD&C BLUE #1)], ENRICHED WHEAT FLOUR (WHEAT FLOUR, NIACIN, REDUCED IRON, THIAMIN MONONITRATE, RIBOFLAVIN, FOLIC ACID), NON-HYDROGENATED VEGETABLE OIL SHORTENING (PALM, SOYBEAN AND MODIFIED PALM OILS), WATER, DEXTROSE, NON-HYDROGENATED MARGARINE [SOYBEAN AND MODIFIED PALM OILS, WATER, SALT, WHEY POWDER, SOYBEAN LECITHIN, MONOGLYCERIDES, NATURAL FLAVOR, COLOR (ANNATTO), VITAMIN A PALMITATE, VITAMIN D3], SUGAR, VINEGAR, SALT. CONTAINS WHEAT, MILK AND SOYBEAN. 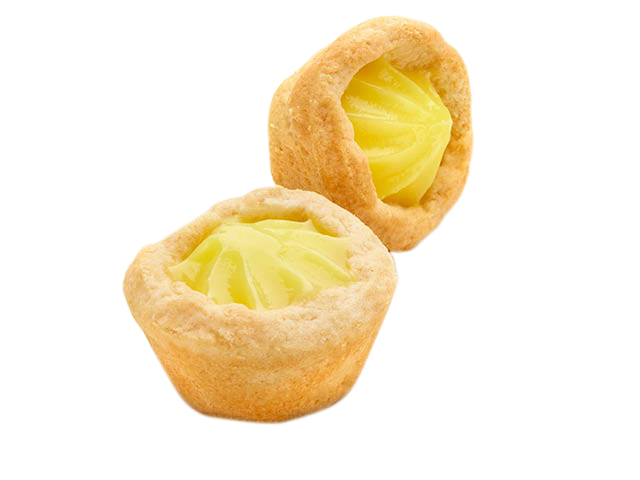 Buttery mini tart shells, filled with a tangy lemon filling. 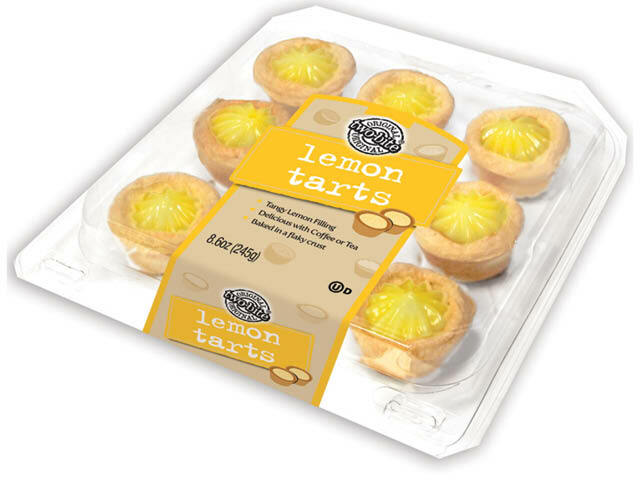 INGREDIENTS: LEMON FILLING [WATER, SUGAR AND/OR HIGH FRUCTOSE CORN SYRUP, MODIFIED CORN STARCH, HYDROGENATED VEGETABLE OIL SHORTENING (CANOLA AND/OR SOYBEAN AND PALM OILS), CITRIC ACID, NATURAL AND ARTIFICIAL FLAVOR, MICROCRYSTALLINE CELLULOSE, CELLULOSE GUM, ENRICHED WHEAT FLOUR (WHEAT FLOUR, NIACIN, REDUCED IRON, THIAMINE MONONITRATE, RIBOFLAVIN, FOLIC ACID), SODIUM CITRATE, LEMON PUREE, SALT, POTASSIUM SORBATE AND SODIUM BENZOATE (PRESERVATIVES), XANTHAN GUM, COLOR (FD&C YELLOW #5)], ENRICHED WHEAT FLOUR (WHEAT FLOUR, NIACIN, REDUCED IRON, THIAMINE MONONITRATE, RIBOFLAVIN, FOLIC ACID), NON-HYDROGENATED VEGETABLE OIL SHORTENING (PALM, SOYBEAN AND MODIFIED PALM OILS), WATER, DEXTROSE, NON-HYDROGENATED MARGARINE [PALM, SOYBEAN AND MODIFIED PALM OILS, WATER, SALT, WHEY POWDER, SOYBEAN LECITHIN, MONOGLYCERIDES, NATURAL FLAVOR, COLOR (ANNATTO), VITAMIN A PALMITATE, VITAMIN D3], SUGAR, VINEGAR, SALT. 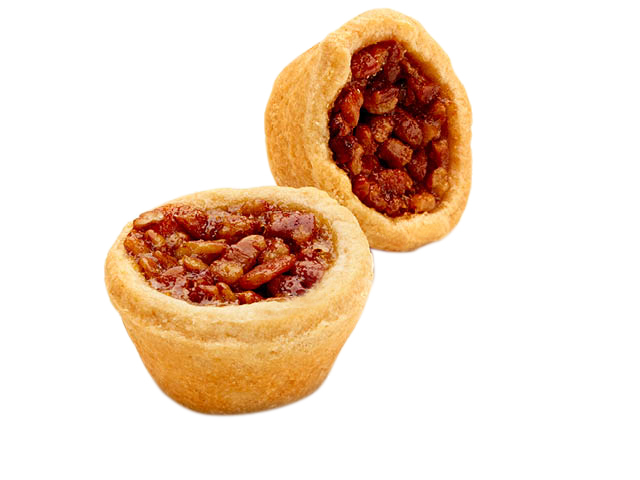 Buttery tart shells with a rich butter tart filling, topped with crunchy pecan pieces. 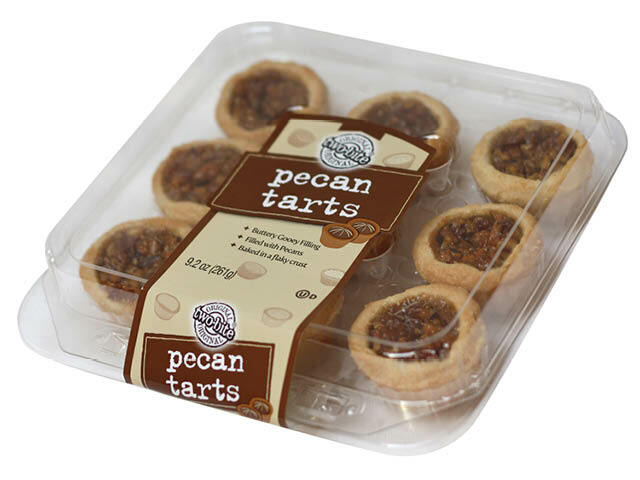 INGREDIENTS: ENRICHED WHEAT FLOUR (WHEAT FLOUR, NIACIN, REDUCED IRON, THIAMIN MONONITRATE, RIBOFLAVIN, FOLIC ACID), CORN SYRUP, SUGAR, NON-HYDROGENATED VEGETABLE OIL SHORTENING (PALM, SOYBEAN AND MODIFIED PALM OILS), EGG, WATER, PECANS, NON-HYDROGENATED MARGARINE [CANOLA, PALM, MODIFIED PALM AND MODIFIED PALM OILS, WATER, SALT, WHEY POWDER, SOYBEAN LECITHIN, MONOGLYCERIDES, POTASSIUM SORBATE (PRESERVATIVE), NATURAL AND ARTIFICIAL FLAVOR, VITAMIN A PALMITATE, VITAMIN D3, COLOR (ANNATTO),], VEGETABLE OIL (SOYBEAN OR CANOLA), DEXTROSE, MOLASSES, VINEGAR, SALT, BUTTER (CREAM, SALT), ARTIFICIAL FLAVOR. CONTAINS WHEAT, EGG, MILK, SOYBEAN AND PECANS. 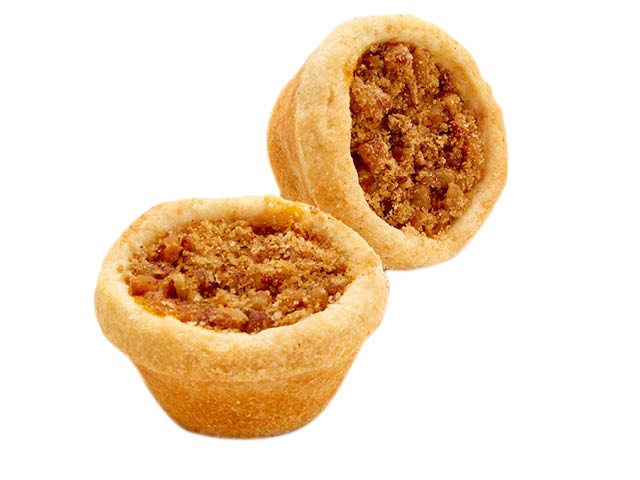 Buttery tart shells with a pumpkin pie filling, topped with a crunchy pecan crumble. INGREDIENTS: ENRICHED WHEAT FLOUR (WHEAT FLOUR, NIACIN, REDUCED IRON, ASCORBIC ACID AS A DOUGH CONDITIONER, THIAMINE MONONITRATE, RIBOFLAVIN, ENZYME, FOLIC ACID), SUGAR, VEGETABLE OIL SHORTENING (PALM OIL, SOYBEAN OIL, FRACTIONATED PALM OIL), PUMPKIN, EGGS, SWEETENED CONDENSED MILK (CONCENTRATED MILK, SUGAR, LACTOSE), WATER, PECANS, SOYBEAN OIL, DEXTROSE, MARGARINE (SOYBEAN OIL, FRACTIONATED PALM OIL, WATER, SALT, WHEY [MILK], SOYBEAN LECITHIN, MONOGLYCERIDES, NATURAL FLAVOR, ANNATTO EXTRACT [COLOR], VITAMIN A PALMITATE, VITAMIN D3), CORN SYRUP, MODIFIED CORNSTARCH, SALT, VINEGAR, CINNAMON, SPICES, COLOR (BETA CAROTENE), POTASSIUM SORBATE (PRESERVATIVE), SOYBEAN LECITHIN, MOLASSES, NATURAL FLAVOR, XANTHAN GUM, LOCUST BEAN GUM, GUAR GUM. CONTAINS WHEAT, EGGS, MILK, SOYBEAN, PECANS.